The University of California, Berkeley has a number of research departments that use university lab products, making the school a great market for scientific product sales leads. Some of the best known life science research units at the University of California, Berkeley include the Berkeley Stem Cell Center, the California Institute for Quantitative Biosciences, the Cancer Research Laboratory, the Center for Science, Technology, Medicine and Society and the Energy Biosciences Institute. According to the latest NIH and NSF funding statistics, the University of California, Berkeley has a wealth of research funding available. When thinking about how to increase sales for lab products, biotechnology vendors should keep the University of California, Berkley market in mind: In 2012, the NIH and NSF gave a combined total of $223.8 million in research funding to the University of California, Berkeley. The NIH alone gave the university $118.6 million. For the convenience of our readers, we have broken down some of the best funded life science departments receiving research funding. For a full list of departments receiving funding, please visit the NIH website. In addition to receiving NIH funding, the University of California, Berkeley received $105.2 million from the NSF in 2012. The top funded NSF life science project at the university focused on "a modular system for high-density, multi-scale electrophysiology," and it received $850,000 in research funding. In 2010, the University of California, Berkeley was ranked 59th in the country by the NSF for total R&D expenditures in the life sciences, having spent $203 million. The NIH also ranked the University of California, Berkeley 50th in the country in 2011 for direct plus indirect costs in the life sciences, excluding R&D contracts and ARRA awards, making the total $119.7 million. Life science marketing events at the University of California, Berkeley are a great way to increase scientific product sales leads. 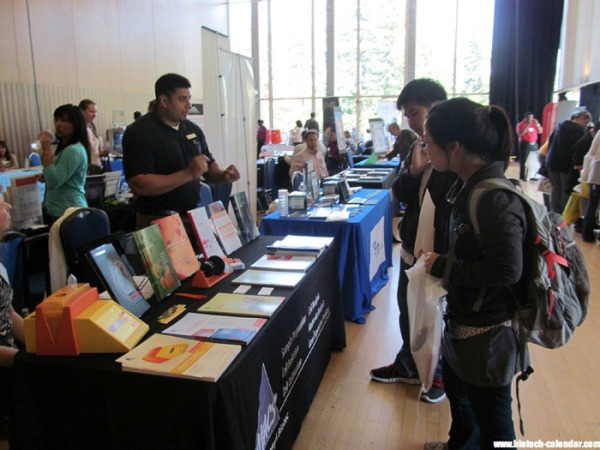 At last year’s Berkeley BioResearch Product Faire™ Event, 128 people attended the show. Of those attending, 35 were purchasing agents, professors, and post docs, and 19 were lab managers. The visitors came from 17 different research buildings and 12 departments across campus. If you are a lab supplier considering how to increase sales for lab products and generate scientific product sales leads in California, Biotechnology Calendar, Inc. invites you to attend our Berkeley BioResearch Product Faire™ Event on June 5th, 2013. Biotechnology Calendar, Inc. is a full service science research marketing and events-planning company that organizes life science marketing events at top research universities across the country. If you are interested in attending a trade show closer to home, we encourage you to check out our 2013 calendar of events. To learn more about University of California, Berkeley funding statistics, click on the button below. Click here for Berkeley BioResearch Product Faire™ Event special offers.